The School of Education Center for Research on Teacher Development and Professional Practices hosted two events during the month of May that involved senate and credential faculty, the director and the coordinator of the credential programs, and doctoral students in the School of Education. The first, on May 13, was a brownbag presentation by two of the Directors of the Talking Teaching, a non-profit organization devoted to the study and refinement of teaching and learning that provides research-based professional development experiences to teachers both locally and at the national level. Bill Saunders and Dave Marcelletti discussed their most recent project focused on the new Common Core Standards. Christina Giguiere, former coordinator of the UCI Multiple Subject Teacher Credential Program, currently principal at Tulita Elementary School in Redondo Beach, and one of her 5th-grade teachers also joined the presentation and added their perspectives on this work conducted at their school site. The second event, on May 14, featured Dr. James Hiebert, Robert J. Barkley Professor of Math Education at the University of Delaware. Doctoral students and faculty shared their research projects on teacher thinking and learning and engaged with Dr. Hiebert in a discussion of a series of articles published in the Journal of Teacher Education last year on improving mathematics teaching in the United States. This event was sponsored by the National Science Foundation through Associate Professor Rossella Santagata’s National Science Foundation Career Grant. The 2013 Michael E. Martinez Prize for Outstanding Doctoral Research and Service was awarded during the June 5th Celebration of Doctoral Student Accomplishments Ceremony. Associate Professor Stephanie Reich introduced the prize, and Mrs. Stephanie Martinez and Mrs. Florence Martinez presented the plaques and cash awards to recipient Anamarie Auger and honorable mention Briana Hinga. Professor Michael E. Martinez was a member of the Department and School of Education for 20 years. He is greatly missed but wonderfully remembered as a colleague, mentor, advisor, teacher, administrator, researcher, and friend. Upon his passing in April 2012, the Michael E. Martinez Prize for Outstanding Education Research and Service was established to honor his life and his contributions. This year – the inaugural year – we had an impressive pool of nominees for this award and two outstanding candidates are being recognized as both the recipient and the honorable mention. The 2013 recipient of the Michael E. Martinez Prize Anamarie Auger. Receiving honorable mention is Briana Marie Hinga. For those of you who had the pleasure of knowing Mike, he was a true scholar with a deep sense of curiosity and interest, but he also was a valuable friend and colleague who took time to help and support others. Both Ana and Briana demonstrate many of these wonderful qualities. That is why they are being recognized for their scholarship and engagement; their contributions as Graduate Student Researchers; their dedication as Teaching Assistants and in Briana’s case, also as a Teaching Associate; their promotion of community-focused activities; and their service to the School and fellow students. Congratulations Briana and Ana. And thank you to Mrs. Stephanie Martinez, Michael’s wife, and Mrs. Florence Martinez, Michael’s mother, for coming to this celebration to present the Michael E. Martinez Prize. ​Eighteen proud graduates are receiving both their bachelor of science degree and their California Single Subject Teacher Credential in the special four-year degree program offered by the UC Irvine Cal Teach Science and Math Program. UCI Cal Teach is a collaborative initiative sponsored by the School of Biological Sciences, School of Physical Sciences, and Department of Education in reponse to the critical shortage of qualified middle and high school math and science teachers throughout the state. The program is designed to offer undergraduates opportunities to explore math and science teaching as a career option. Receiving a bachelor's degree in Mathematics along with the California Teacher Credential are the following seniors: Jessica Armas, Luis Carrera, Anthony Chan, Brianne Hazlewood, Andrew Knauft, Allison Mok, Seyoung (Christine) Chin, Nicolas Tang, Chak (Chuck) Woo, and Mei Ying (Katy) Yan. Receiving their bachelor's degree in the new combined Biology/Education major, which includes the California Teacher Credential, are Matthew Coy, Marcus Evangelista, Nicole Gassner, Danny Nguyen, and Adeline Tang. Receiving their bachelor's degree in Earth System Science and the California Teacher Credential are Stephanie Hwang and Alice Kim. ​Receiving a bachelor's degree in Earth and Environmental Science and the California Teacher Credential is Jung Yeon (Ashley) Kang. During the 2012-2013 academic year, a total of 102 undergraduates enrolled in the Cal Teach gateway course, and over 50 freshmen and sophomores declared a math or science major with the Cal Teach teaching credential option. Twenty-seven four-year combined B.S. degree plus California Teaching Credential graduates are expected to complete their degree requirements in 2014. 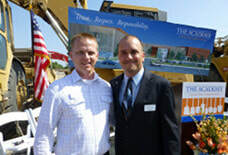 On May 15, administrators, educators, civic leaders, donors, students, and other invited guests gathered in Santa Ana at 1901 North Fairview Street for groundbreaking ceremonies for The Orange County Academy Charter High School. Amidst earthmovers and surrounded by 7.1 acres of leveled ground purchased by the Orangewood Children's Foundation, well-wishers and supporters celebrated the vision, determination, and efforts of those who contributed to the occasion. To provide a transformational learning environment to foster, underserved, and community teens that offers consistency, stability, support, and a community in which to belong, thrive, and grow into successful, independent adults. The Academy master plans call for completion of the campus in several phases over the next five years. School will begin August 2013 with 120 freshmen in temporary classrooms. Future phases include a three-story academic building, family-style residential housing for Academy foster youth who need stable housing, a student services building with a student union and theater, and a gymnasium. When the campus is completed, there will be 480 students enrolled, 80 of whom will live on campus [Source: Inaugural edition of capital campaign newsletter]. ​The Academy Charter High School is the first Orange County charter school supported by the Orange County Department of Education. 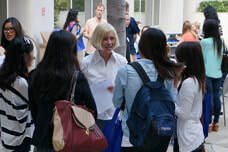 The UC Irvine School of Education has partnered with The Academy for mutually beneficial collaboration in curriculum development; volunteer service from university students as tutors, mentors, classroom assistants, and afterschool program support; research and evaluation; after-school and summertime activities; college and career advising; and scholarships. Ph.D. Candidate Adam Sheppard has been hired as the Student Life Coordinator for The Academy. ​The UC Irvine Division of Undergraduate Education Undergraduate Research Opportunities Program (UROP) sponsors a yearly UCI Undergraduate Research Symposium. The event gives selected undergraduates the opportunity to present the results of their research or creative activities in a professional setting, either as a poster or an oral presentation. The 2013 theme, "Undergraduate Research: Passion and Values," highlighted the dedication and integrity that are critical elements of the research process. * Do Play Location and Crowding Have an Effect on Toddlers’ Prosocial and Aggressive Behaviors in a Childcare Setting? The 2013 Keith Curry Scholarship was awarded to Ph.D. student Alma Zaragoza-Petty during the June 5th Celebration of Doctoral Student Accomplishments. Dr. Curry, Chief Executive Officer of the Compton Community College District and graduate of the UCI/UCLA Joint Ed.D. in Educational Administration, established the fellowship to help support the studies of a current Ph.D. student who has demonstrated significant growth in academic achievement and unusual perseverance – qualities that Dr. Curry believes characterized his journey toward his doctorate. Associate Professor Rebecca Black introduced the scholarship, which was presented to Ms. Zaragoza-Petty by Dr. Curry. Dr. Keith Curry received his Ed.D. degree from the UCI/UCLA Joint Ed.D. in Educational Administration in 2011. He currently is Chief Executive Officer of the Compton Community College District, overseeing all departments and functions in the district. Upon receipt of his doctorate, Dr. Curry funded a School of Education Scholarship to benefit the research activities of doctoral students who demonstrate commitment and perseverance. The 2013 recipient of the Keith Curry Scholarship is Alma Zaragoza-Petty. Ms. Zaragoza-Petty is a first generation high school and college graduate and a Eugene Cota Robles Scholar. Since she first enrolled in East Los Angeles College, Alma has never wavered in her determination to earn a doctoral degree and become an advocate for higher education access and equity. Congratulations Alma, and thank you, Dr. Curry. Doctoral student Huy Chung was honored during the June 5th Celebration of Doctoral Student Accomplishments with the Graduate Student Association Service Award. The award was introduced by Association Vice President Chenoa Woods and presented by Association President Anamarie Auger. The Associated Doctoral Students in Education is a graduate student organization that is in its inaugural year. The organization was created to foster a supportive and collaborative graduate community, and also provide a more streamlined way to have representation on various committees and facilitate communication within the school. The Service Award that I am presenting today was created during the first meeting of the organization, with the intention to honor a student’s service and involvement in the School of Education. In actuality it was created to honor the remarkable service Huy Q. Chung has provided to the graduate student community. For those of you that do not know, Huy worked extremely hard to create the graduate student organization, by writing the bylaws, designing and setting up the website, creating the positions in the organization, and single handedly managing the voting process, which was no small feat. In addition to Huy’s instrumental involvement in creating ADSE, he has also been involved in several committees on campus including the university wide graduate student organization, serving as the student representative to the faculty meetings, and the professional development student coordinator. Huy is known throughout the Education graduate student community, as someone who goes out of their way to help others, who provides support and encouragement, is always the first to volunteer for everything, and is someone many of us are lucky enough to call a friend. It is an honor to present him with this award today. ​On May 29 the School of Education's Communication Director, Nancy Christensen, attended TEDx Tbilisi in Georgia. One of the presenters, Vlad Lozinski, a journalist with more than 30 years experience in international television news coverage, delivered a session titled “You Want to End Conflict, Ignorance, and Poverty? Start a Children’s Online Newspaper.” During his presentation, he discussed the progress of an English Language program that he had helped introduce in Georgia’s Pankisi Valley in 2007. ​Following the TEDx Conference, Mr. Lozinski facilitated invitations for my daughter, Camrin Christensen, Eurasia Partnership’s Regional Director for the Caucusus, and me to visit the Pankisi Valley and talk with the young students who enrolled in the English language class and now are producing a student-generated newspaper, The Pankisi Times. Mr. Lozinski explained that the newspaper has emerged from student interest in giving meaning to their language study and represents their desire to connect to the world beyond their beautiful, isolated, and historically troubled valley. Visiting with the young people would provide an opportunity to see a working example of the concept Self-Organized Learning. During an afternoon reception, the School of Education hosted children and parents from Stepping Stones School and thanked the children for the artwork they have contributed for the School of Education's latest exhibit of children's creativity. Principal Esther Kim explained that the children's artwork reflects the integrated learning approach employed by the school, which follows the Reggio Emilia approach to early childhood education. The Reggio Emilia approach is evident in the artwork on display. For example, artwork featuring flowers grew from studying how plants grow (science), observing the emergence of leaves and petals (science and numeration), and drawing and painting a representation of the plant in different stages. Weaving required attention to number of stitches (mathematics), alternation of rows and tension of yarn (mathematics and science), and selection and arrangement of colors (artistic composition). The Stepping Stones artwork is the latest in a series of children's art exhibits in the School of Education showcasing the innovation and creativity that art can engender from pre-school age through high school. ​The artwork, which includes paintings, weavings, and multimedia creations, will be on display during the remainder of 2013. On June 5, the Director of Undergraduate Education Sue Marshall and CASE Director Professor Joseph Mahoney hosted a recognition ceremony for the 2013 undergraduates who had completed requirements and earned their Certificate in After School Education (CASE). The certificate, established in 2008 as the first of its kind in the nation, is designed to address the educational gap that exists between the impact that well-trained after-school staff can have on program quality and the lack of formal training opportunities generally available to after-school staff. To earn a certificate, undergraduates must complete a minimum of five courses totaling 20 quarter units along with a minimum of 70 hours of field experience. For field experience opportunities, the School of Education partners with local after-school sites including Girls, Inc., Adams Elementary School (THINK Together site), College Park Elementary (Project Success site), Sepulveda Elementary (THINK Together site), Turtle Rock Elementary, UC Irvine Extended Day, and Kidwords (Dan Donahue Center, Townsend Center, and Bishop Manor Center). During this past year, CASE program participants contributed a combined total of more than 1,500 hours of service to these local after school sites. On May 18, the School of Education held its third annual event for alumni and community partners. Participants, who included both School partners and graduates from the School's three doctoral programs, the Master of Arts in Education, the Teacher Credential programs, and the Undergraduate Minor in Education, were greeted by Professor and Dean Deborah Lowe Vandell and Director of Teacher Education Virginia Panish before attending two consecutive workshops they had selected from six options. From 10:35 to 11:20, participants enjoyed refreshments and the opportunity to network with colleagues and university faculty. Math Circle Group, an optional third selection, was presented by doctoral student Cathery Yeh and the California Mathematics Council-South (CMC-S) Common Core State Standars Committee. The University of California, Irvine, presented 2013 Staff Service Awards to four members of the School of Education. Receiving recognition for their service were Cheryl Craft, Administrative Operations Manager/Academic Personnel (pictured left); Sarah Singh, Credential Program Counselor (picture center); Tammy Ho, Personnel Manager (pictured right); and Whitney Young, Cal Teach Program Coordinator (seated). ​Whitney Young was thanked for her five years of service, Tammy Ho for 10, Cheryl Craft for 20, and Sarah Singh for 25.